If you wanted to have a major summit meeting, by this time the place to have it was Milan. This was where Constantine and Licinius met to celebrate the wedding of Licinius to Constantine’s sister and to sort out the details of their alliance. But they didn’t have long. Licinius found himself under attack by Maximin and Constantine was attacked by the barbarians. Maximin would no doubt have been watching developments and weighing up the new balance of power in the empire now that his ally Maxentius had been removed from the chess board. Constantine’s possessions looked good on a map, and of course included Rome itself which was good psychologically. But the East was where the money and the trade was. With a bit of effort Maximin could still emerge as the top dog. And he may well have been thinking as much of survival as anything else. Gibbon commented that Constantine had probably calculated that if he wished to live he had to rule. The same was true of Maximin. So before the other emperors were even aware that he planned a war, Maximin was already across the Bosphorus and deep in the territory of Licinius. This advantage wasn’t bought without a price. He had considerable losses on a forced march carried out through dreadful weather. He laid siege to Byzantium which fell after 11 days and then proceeded to attack Heraclea. He captured this as well, and then learnt that Licinius was pitching camp some 18 miles away. After a show at negotiation, during which both sides tried to win over the other’s troops, a battle was fought. On paper it should have been a shoe in for Maximin who had some seventy thousand soldiers under his command against only thirty thousand for Licinius. But the superior quality of the generalship of Licinius won out and he was victorious. Maximin had advanced at tremendous speed, he now fled even more quickly. He was seen the next day in Nicomedia. According to Google maps this is a distance of 130 miles – or roughly the distance between London and Paris. This was about the maximum speed it was possible to travel across land at the time. But the execution of the twenty year old Candidianus was a really dark mark. He was the natural but illegitimate son of Galerius, the friend and benefactor of Licinius. His father had no doubt expected him to be looked after, so this really was an outrageous breach of faith as well as being pretty hard hearted. Her estates were confiscated, her eunuchs and domestics devoted to the most inhuman tortures; and several innocent and respectable matrons, who were honored with her friendship, suffered death, on a false accusation of adultery. Pathetically, and rather tragically, the aging Diocletian attempted to intercede on behalf of his family, with no effect. I suppose if you are an emperor you probably don’t feel the need to turn on the charm. But we’ll never know whether Maximin would have worn her down and won her over in the end, because he lost out to Licinius. This made the position of Priscus and Valeria even worse. He sentenced them to death. They went into hiding for a couple of years but eventually were recognised, captured and summarily executed. They were beheaded and their bodies thrown into the sea. The antipathy of Maximin is at least understandable if not particularly noble. What motivated Licinius has not survived in the historic record. What is clear is that even by the abysmally low standards of Roman emperors he was a callous and brutal man. His cruel treatment of the wife and daughter of a great emperor is one mystery. It is also hard to account for why he then proceeded to pick a fight with Constantine, and the very year after he had defeated Maximin. The ambitious character of Constantine was perhaps part of his calculation. Since it was highly likely Constantine would be coming after him at some point it may have seemed like a good idea to strike while his troops were in good spirit after their successful campaign in the east. Or maybe the opportunity that arose was simply to tempting to pass up on. Constantine had elevated a man called Bassianus to the rank of Caesar and cemented the deal by marrying his sister to him. But in the process he had managed to alienate Bassianus in some way. The newly minted Caesar and Licinius were soon in touch. But Constantine got wind of the plot early on and quickly had Bassianus killed. Licinius did not try to hide his involvement and instead started destroying the statues of Constantine. Once again, the empire was at war with itself. Constantine advanced remorselessly, even though Licinius was far from a feeble opponent. The first battle was fought just inside the territory of Licinius, with Constantine overcoming a larger force. This was rapidly becoming his trademark. Licinius retreated but in good order, and a larger battle was fought in the middle of the Balkans. This was indecisive but Licinius again retreated. Constantine assumed he was heading towards the strong defensive position of Byzantium. But in fact Licinius had retreated to Macedonia and as Constantine approached Byzantium Licinius was able to cut his lines of communication. Licinius had put himself in a strong postion. He appointed his general Valens as Caesar and opened negotiations for a peaceful end to the conflict. Constantine had had the better of the campaign so far, but Licinius had proved himself a worthy opponent. What looked like a reasonable compromise was worked out. Licinius was left with a lot of what he had been in charge of before the war broke out, but ceded the Balkans and Greece to the Western half of the empire. Three Caesars were appointed – two of Constantine’s sons and the one son of Licinius to fill the next rank. The recent elevation of Valens to Caesar level was an obstacle to this arrangement. So he was deposed and killed. He had only reigned a few days. Gibbon points out that this aspect of the treaty was a humiliation for Licinius. I imagine it wasn’t exactly a ‘my how we laughed’ moment for Valens either. Constantine was now undisputed emperor in the West, his writ running from the borders of Scotland to the tip of Greece. For eight years the two halves of the empire existed in peace. But the two men must have viewed each other with suspicion. Meanwhile although there was peace within the empire, there was plenty of fighting going on on the borders. Crispus showed himself to be a worthy successor to his father and grandfather by displaying skill and courage in battles with the Franks and Alemanni. Constantine kept his own military skills finely honed fighting off a Gothic invasion across the Danube. He crossed into Dacia and took the war back to the Goths themselves and forced them into a treaty where they were obliged to provide troops to serve the emperor when required. While all this was going on Licinius was getting older and even less popular. Eventually Constantine decided that the time was ripe to reunite the empire under the rule of one man, namely himself. Without troubling to create any kind of pretext he simply invaded the provinces of Licininius. Licinius responded with spirit and ability. He gathered together an extensive army and fleet. He took up a strong defensive position at Adrianople. This gave Constantine a tough obstacle, especially as he was attacking with a smaller force. It took several days before Constantine could break through, but eventually the superior quality of his veteran and experienced troops paid off. His personal courage was also a factor – though the story that he swam across a river with only 12 cavalrymen by his side and put thousands to flight the other side must have been made up. What is certain is that he inflicted very high casualties on the Eastern army and Licinius was forced to retreat to Byzantium. But once he was there his situation was not too desperate. He had a much larger fleet than Constantine and so could maintain his supplies. It looked like a stalemate, but once again superior leadership swayed the result. This time it was Crispus who took the initiative leading his ships against the fleet of Licinius while it was in narrow waters where its superior numbers were not so advantageous. After a battle of 2 days he proved victorious. This changed the whole situation. It was now possible to cut Byzantium off completely making it only a matter of time before the city ran out of supplies. Licinius wasn’t really into the heroic last stand thing and slipped across the Bosphorus to Chalcedon with his family and treasure when it became clear what was happening. He also appointed one of his chief ministers, Martinianus, as a Caesar – which I imagine must have been accompanied by one of those sinking feelings. In the meantime Constantine built towers, catapults and battering rams to speedily bring Byzantium under his control. Licinius still wasn’t ready to give in. He raised yet another army and returned to attack Constantine while he was still occupied with Byzantium. Constantine divided his forces to meet the new attack. Once again Licinius joined battle with superior forces, and once again was defeated. After this final battle Licinius surrendered. He was promptly invited to Constantine’s victory banquet. I can’t help wondering what they talked about. ‘Boy, you kicked my arse there’ maybe. But Licinius was still Constantine’s brother in law and had given Constantine a run for his money. He must have had some level of respect for the murderous but resourceful and determined old man. Martinianus wasn’t so lucky. He was executed straight away. But Licinius did not get off scot free. He was imprisoned in Thassalonica, and later was found guilty of trumped up charges of conspiring with the barbarians. So he ended up being killed after all. Constantine was now the sole ruler of the Roman world. The year is 324. 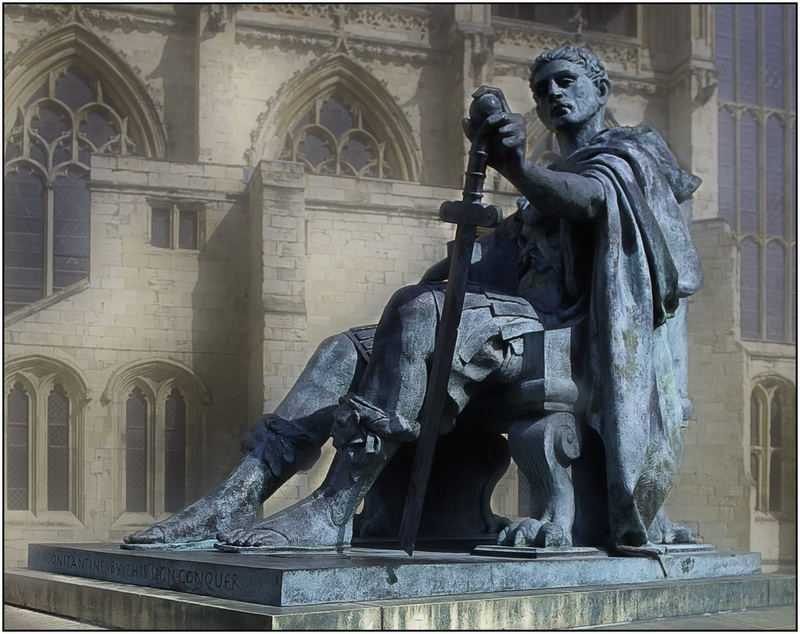 Constantine’s reign will become one of the most significant in Roman history. If he had just moved the capital of the empire from Rome to Constantinople that would have been enough to keep his name on people’s lips. And likewise, being the emperor who established Christianity as the state religion would on its own have secured his place in the history books. But of course he did both. In the next chapter Gibbon doubles back to track the rise of Christianity. Before following him, I’d like to quickly review the state of the empire as Constantine inherited it. For a start, Christianity had been pretty well supported by Licinius in the Eastern half of the empire. He had certainly not persecuted the Christians and it is not inconceivable that he himself was a sympathiser or even an adherent. The cruel behaviour that Gibbon attributes to him may well have been propaganda originating from Constantine’s court. By 324 the years of official action against Christians was a pretty distant memory. Constantine no doubt had a lot to do with the establishment of Christianity but he was probably not swimming too hard against the tide. Another point that Gibbon alludes to is the economic decline of the empire. This is confirmed by modern research. A week or so ago I came across an interesting blog post reviewing the state of our knowledge about the scale of trade in the ancient Mediterranean. One set of data caught my eye. They had plotted the ages of shipwrecks in the Mediterranean. There is a huge drop in the numbers from about the time of the crisis of the third century. It looks like the political crisis coincided with an economic crisis. My speculation would be that it was the political problems that caused the economic crisis – but we have no way of knowing. What does seem clear is that Diocletian’s stabilisation of the government did not lead on to a revival in trade. We saw in Gibbon’s account that skills had declined in Rome when we heard about the shortage of good stone masons. Moving the capital east may have been a response to the decline in the economic status of the city of Rome. There was simply more wealth in the east. The rise of Christianity might also have the same root cause. As the economy contracted people’s lives became less secure. The early Church’s welfare activities might well have been seen as a useful insurance policy in troubled times. Chapter 15 was the most controversial part of Gibbon’s work, and can still be contentious. It is also one of the longest chapters. I hope I can do it justice.